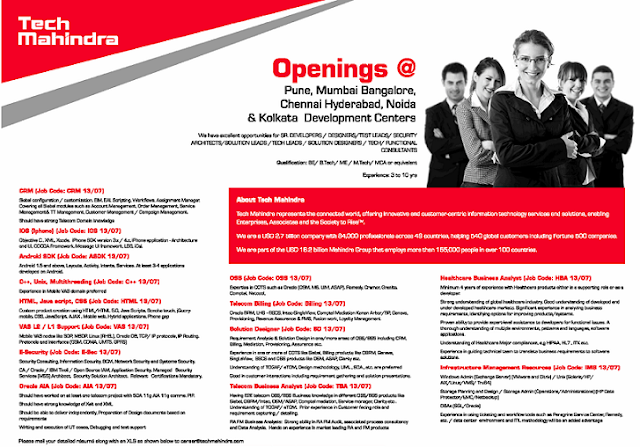 Lookinf for Tech mahindra company jobs? Want to register on it? We have provided registration link below. Check here. Part of the Mahindra Group, Tech Mahindra is a US$4.03 billion company with 105,000+ employees across 51 countries. It provides services to customers which include Fortune 500 companies. It is also one of the Fab 50 companies in Asia, a list compiled by Forbes. Tech Mahindra was ranked #5 in India's software services (IT) firms and overall #111 in Fortune India 500 list for 2012. Tech Mahindra, on 25 June 2013, announced the completion of a merger with Mahindra Satyam. The Job Applicant can follow the below steps-Job Applicant should have a QR-code app and a smartphone or tablet equipped with a camera. Enter the Captcha code for first level verification. On successful verification of the Captcha code QR app displays the information of the offered candidate such as Candidate applicant ID, Name and Email ID.